A work from the early years of the Bauhaus, presumed lost for the past 80 years, has been recovered in 2004: the 'African Chair', created by Marcel Breuer and Gunta Stölzl. 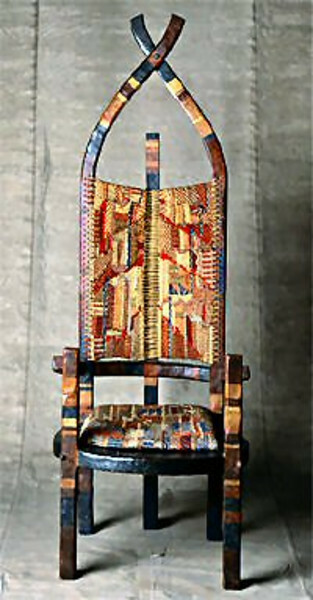 Made of painted wood with a colorful textile weave, this chair embodies the spirit of the early Bauhaus like no other object. The seat and back of the chair employ a woven textile. Gunta Stölzl in a letter to H.M. Wingler, 07.01.1964: "That was the first time we worked together. I produced the fabric. I threaded and tautened the warp directly through the holes in the frame and wove the texture onto the chair itself... the forms were freely invented and without repetitions..."
In the seat and back of the second chair, Stölzl employed the taut strips of woven upholstery which were to characterize so much of Breuer’s later work and which he developed together with Gunta Stölzl and her weaving workshop. Painted in blue, different reds, yellow, gold.